Citation Information: J Clin Invest. 2011;121(9):3609-3622. https://doi.org/10.1172/JCI45816. NK cells are a major component of the antitumor immune response and are involved in controlling tumor progression and metastases in animal models. Here, we show that dysfunction of these cells accompanies human breast tumor progression. We characterized human peripheral blood NK (p-NK) cells and malignant mammary tumor-infiltrating NK (Ti-NK) cells from patients with noninvasive and invasive breast cancers. NK cells isolated from the peripheral blood of healthy donors and normal breast tissue were used as controls. With disease progression, we found that expression of activating NK cell receptors (such as NKp30, NKG2D, DNAM-1, and CD16) decreased while expression of inhibitory receptors (such as NKG2A) increased and that this correlated with decreased NK cell function, most notably cytotoxicity. Importantly, Ti-NK cells had more pronounced impairment of their cytotoxic potential than p-NK cells. We also identified several stroma-derived factors, including TGF-β1, involved in tumor-induced reduction of normal NK cell function. 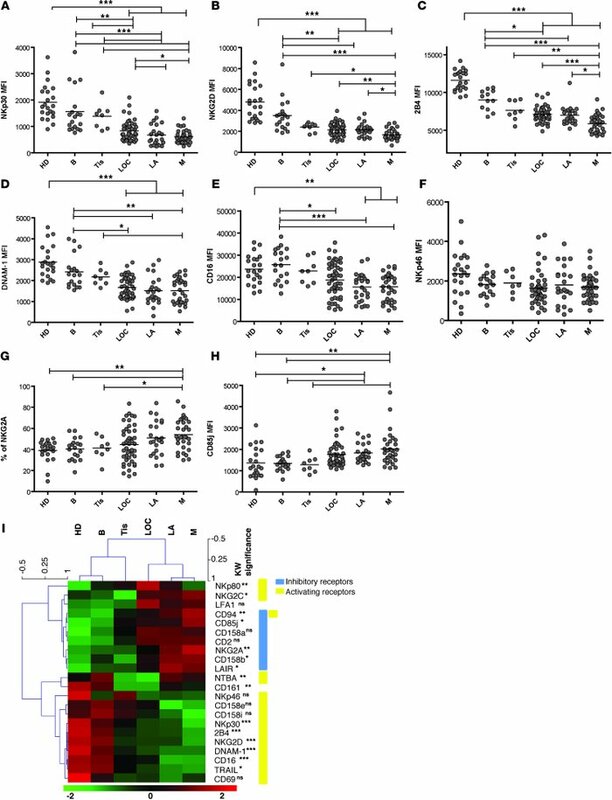 Our data therefore show that breast tumor progression involves NK cell dysfunction and that breast tumors model their environment to evade NK cell antitumor immunity. This highlights the importance of developing future therapies able to restore NK cell cytotoxicity to limit/prevent tumor escape from antitumor immunity. Phenotype of p-NK cell receptors in patients with different stages of BC at diagnosis and controls. (A–H) Receptors were significantly altered among the different control groups and BC patients. The individual mean fluorescence intensities (MFI) (unimodal expression) or percentages of cells positive for given markers (bimodal expression) were graphed for the following receptors: (A) NKp30 (MFI); (B) NKG2D (MFI); (C) 2B4 (MFI); (D) DNAM-1 (MFI); (E) CD16 (MFI); (F) NKp46 (MFI); (G) NKG2A (percentage of cells positive for NKG2A); and (H) CD85j (MFI). For each scattered plot, the horizontal bar represents the mean value. (I) Summary of the median expression of the 22 NK cell receptors tested in the peripheral blood of controls and BC patients. MFI or percentage of positive cell median values were submitted to a hierarchical clustering program to obtain a global view of receptor expression in the different groups. HD (n = 22), B (n = 19), Tis (n = 7), LOC (n = 55), LA (n = 26), M (n = 32). Statistical analyses were done using nonparametric unpaired Mann-Whitney U test and Kruskal-Wallis (KW) ANOVA. *P < 0.05; **P ≤ 0.005; ***P ≤ 0.0005.